During World War II, approximately 30,000 Jewish men and women fought back against the Germans in organized, armed resistance units. They established secret encampments deep in the forests and mountains and hid beneath straw in barns provided by friendly farmers. They scrounged for food to eat and clothes and fuel to keep them warm in the brutal Polish and Russian winters or the cold and wet climates farther west. Despite these hardships, they found ways to hit back at their would-be killers, interrupting food deliveries, sabotaging power plants and factories, and blowing up enemy trains. 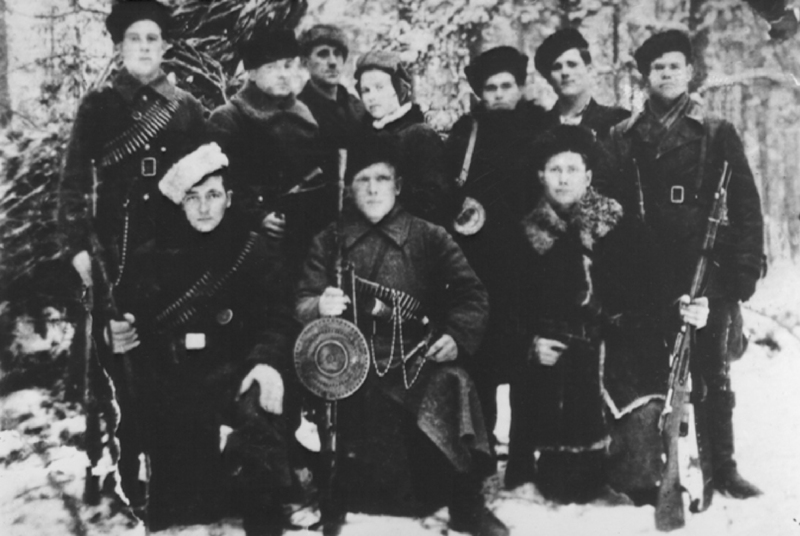 These brave men and women were known as Jewish partisans. Most were civilians. Many were young, and many had left their homes behind. Being young freed them from the responsibilities that tormented those with small children or elderly parents in the besieged ghettoes. Their struggle to survive against an enemy whose goal was to wipe them from the face of the earth is a little-known part of Holocaust history. Jewish partisans could be found in every Nazi occupied country in Europe. Most joined existing non-Jewish partisan groups. In Lithuania, for example, Jews made up approximately ten percent of the partisan units. Jews also joined the French Resistance, known as the Maquis, and fought alongside fellow resisters in Greece and Italy. Jewish partisans faced numerous obstacles. The German army occupied much of Europe and local police forces were under their control. What’s more, enemies of the Nazis were not necessarily friends of the Jews. Antisemitism and hatred of Jews was widespread, particularly in rural areas of Eastern Europe. Traditional dress or accents often made it difficult for Jews to blend in. Jewish men, unlike many of their non-Jewish male counterparts, were almost always circumcised and therefore could be easily identified. Many villages harbored Nazi sympathizers. Turning in a Jew could earn a villager a bag of sugar or a bottle of vodka. Some collaborators hated Jews so much that they did not bother to collect their bonuses, shooting them on sight. Even in their own units, Jewish partisans were often forced to conceal their identity lest they be subject to the antisemitism of their partisan comrades. Because of these dangers, Jewish partisans sometimes formed all-Jewish resistance units. Of all the challenges faced by commanders of partisan units, perhaps the greatest was feeding their fighters. Finding food depended on many factors: the proximity of friendly locals, the geography and nature of the country, the size of the partisan unit. Despite wartime shortages in areas free from direct German rule, sympathetic townspeople and farmers could be relied upon to supply partisans with food and other necessities. In areas under German control or unsympathetic farmers, the search for food could end in death. Jewish partisans with their Zemlyanka shelter. To procure food, partisans sometimes had to resort to force. “The friendly Polish peasant provided food for us—and the unfriendly Polish peasant provided food for us as well,” recalled Mira Shelub. Shelub was seventeen when she and her sister escaped to the forests to join the partisans. “When unfriendly villagers prepared food for the German occupiers, we took the food and left a receipt. The receipt said: ‘The partisans were here.’” More than a jab at enemy forces, the receipts were meant to save the lives of farmers whose food fed the partisans rather than the Germans. With both sides taking food at gunpoint and threatening to punish those who supported their enemies, local farmers were often between a rock and a hard place, no matter who they truly sided with. The shopkeeper subsequently turned down Frank’s offer of payment. In constant fear of discovery, partisans were always on the move. Eastern Europe’s vast and dense forests seemed to have been specifically designed for partisan fighting. Many Jewish partisans who were local to the area knew these forests intimately. The Germans did not, and avoided them whenever possible—unfamiliar soldiers could get lost, be surrounded, and killed. The forests also concealed so-called “family camps” where Jewish escapees from the German camps or ghettos—many of whom were too young or too old to fight—hoped to wait out the war, sometimes shielded by Jewish fighting groups or their allies. Establishing a camp was no easy task. Location was all-important, as was the size of the unit. Partisan camps had to be remote, yet close enough to a village or town to secure the necessities of life. Some partisan units were small, numbering dozens; others ran into the thousands. Large or small, all faced the problems of providing life’s basic necessities, food and shelter, to say nothing of protection from the enemy soldiers and civilians who hunted them. In the larger units, everyone had a specific task. Some foraged for food, some did the cooking, others stood guard or went on fighting missions. There were bakers, weapon cleaners, tailors, and shoemakers. The bakers and cooks needed firewood year-round. Large stores of firewood had to be laid in for warmth in winter. Both were jobs for the wood gatherers. In the quest for survival, no skill or talent was left untapped. In summer, warm weather allowed partisan groups in Eastern Europe to survive with minimal shelter. Soviet partisans from the Molotov partisan brigade. “The trees, the sky, the pine needle ground were our summer home,” recalled Mira Shelub. In France, Italy and Greece, three factors greatly helped the partisans in their search for food and shelter: the climate was temperate, the local population tended to be more sympathetic to their cause, and antisemitism was less pronounced. Most Jewish partisans who fled the ghettos and camps did so with nothing more than the clothes on their backs. As with food, clothing was a scarce and valuable commodity. “I had a pair of boots that a friend found for me,” recollected Polish-Jewish partisan Sonia Orbuch, “but they were too small. My blisters were as big as a fist. But I had to keep wearing them. They were all I had.” Orbuch was lucky to have shoes at all. Shoeless partisans were known to resort to extreme measures to protect their feet, especially in winter. Some partisans, for example, made their own footwear by wrapping their bare feet in strips of cloth and soaking their swaddled feet in water until their “boots” froze solid. What clothes partisans possessed often were reduced to rags through constant wear. Any opportunity to acquire better clothing—a coat, heavy boots, anything with fur to keep out the cold—was fair game. If villagers or farmers proved uncooperative, the partisans “organized” (that is, stole) the warm clothes they needed, at gunpoint, if necessary. Sometimes clothing was taken from the corpses of fallen comrades-in-arms. Enemy dead likewise might yield winter coats and boots. German uniforms were particularly prized trophies: they were warm and served as disguises for future missions. A single item of clothing could make a world of difference, like the wool blanket Greek partisan Leon Idas gained after a successful skirmish with German soldiers. “That was the best present I ever had,” Leon recalls. But what held for Germans also held for partisans. Footprints in the snow could give away their location. To prevent discovery, partisans would return to camp taking different routes. Some, like Jewish partisan Romi Cohn, even mastered the skill of walking backwards to avoid being tracked. Exposure to extreme temperatures could have disastrous, even fatal, consequences. Polish partisan Sonia Orbuch’s frost-bitten legs were badly burned when she sat too close to a fire that her numbed feet could not feel. Daniel Katz ran between five and seven miles each night in the Russian forest to keep from freezing to death. Partisans living in barns found an additional source of warmth in the body heat of animals. The unseasonably cold temperatures created other problems as well—fingers froze on weapons, guns jammed, and the smoke from even small fires could be seen for miles around. The missions Jewish partisans undertook— sabotaging German forces and supplies, handling explosives, disrupting communications—were fraught with danger. 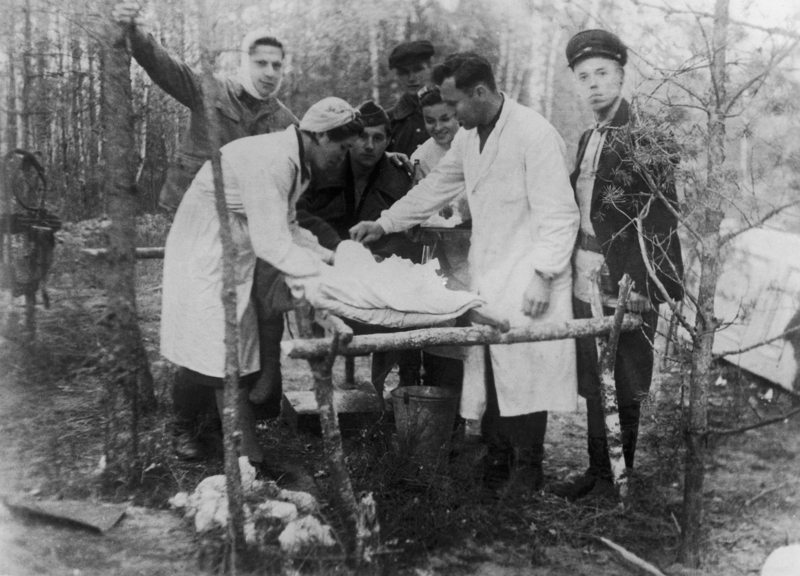 Doctors treat Jewish partisans at a field hospital. The doctor complied and Salsitz escaped. Eta Wrobel survived a different challenge. Shot in the leg in the course of a mission, she went to see, “a Polish doctor who was friendly to us.” The bullet had been lodged in her leg for months, causing pain and swelling. “I would go when his wife was not there,” she recalled, “because he said he didn’t trust her. He gave me a knife and a bottle of spiritus [alcohol]. I removed the bullet myself. What choice did I have?” Later, Wrobel would use her hard-won expertise to remove bullets from the bodies of fellow partisans. What would you do if you had to survive a freezing winter in the woods, with no special tools or materials for building a shelter? What if you didn’t want anyone to find you? How would you make your shelter without attracting attention, and then, once you’d built it, how would you disguise it? Partisans hiding in the forests of Eastern Europe faced these dilemmas. 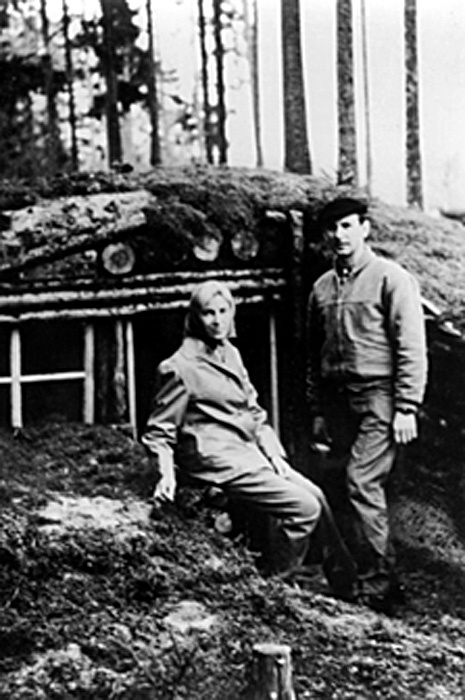 They made shelters they called zemlyankas, from the Russian word for “dugout.” Their building materials were taken from the forest itself and, whenever possible, from nearby villages. Careful to hide any evidence of their location, they usually did this work at night. Eta Wrobel tells how her unit made zemlyankas: “We removed the earth and carried it many kilometers away. Then we would steal the doors to a barn, to make the door. We even moved trees onto the top. If anyone saw us, we had to start again.” Everyone pitched in, racing against time to get the shelters ready. Simon Trakinski recalls: “One time we built a camp from nothing in three days,” making bunkers for his group of 200 people. This work had to be done over and over again, as partisans kept moving, one step ahead of their enemies. Inside the dark bunkers, the hours passed slowly. Simon Trakinski remembers that the only light came from little sticks of burning wood stuck into the earthen walls. The smoke stung his eyes and those of his comrades and soot coated their faces. Eta Wrobel couldn’t forget how hard it was to sleep. Ten or twelve people lay side by side, fully clothed and closely packed to keep warm. “When one person turned, everybody had to turn, “she recalled. Sometimes the discomfort and, particularly, the fear of being closed in was more overpowering than the cold. After Jews who were staying inside a zemlyanka had been murdered by Polish collaborators, Norman Salsitz resolved to never sleep in a zemlyanka again. “I decided I was not going to go in a bunker... because you couldn’t even stand up, you were laying there—and the lice!” Instead, he slept outside, burrowed in the snow for warmth. Sources: © Jewish Partisan Educational Foundation. Used with permission. To watch short films about this topic, click here.